This is an unbeatable collection including chunky winter warmers, oriental broths, spicy fish chowders and hundreds of classic, chilled, clear, creamy, meat, bean and vegetable soups. 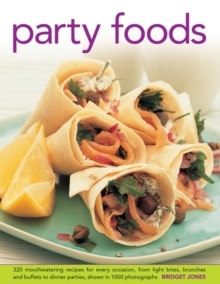 It is a great selection of recipes for all occasions, from light and healthy lunches to hearty supper dishes, and from quick weekday standbys to elegant dishes for entertaining. It offers new twists on old classics - Smoked Haddock Chowder with Thai Basil, Duck Broth with Orange Spiced Dumplings. 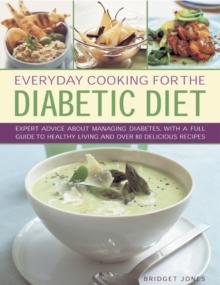 Step-by-step guidance on making 500 sensational soups, with glorious photographs for quality results. East meets West in a range of spicy broths, rice soups and pasta soups, including Lamb Soup with Rice and Coconut, Red Onion Laksa or Sweet-and-Sour Vegetable Borscht. 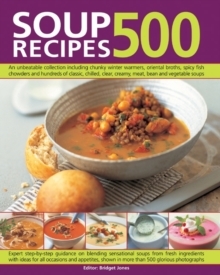 500 soups made simple: sections include chilled; creamy; bean and pea; vegetarian; noodle; pasta and rice; fish and shellfish; poultry; and meat and game soups. All the soups you will ever need in one essential, easy-reference guide. 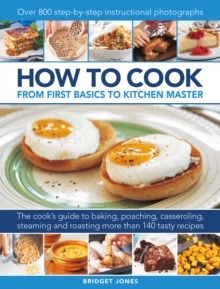 This stunning collection of 500 recipe ideas is based on one of the world's best-loved dishes. 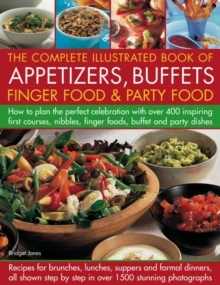 Here is every classic and popular soup from around the world as well as scores of new and contemporary ideas. You can try Fiery Tomato Soup with Red Pepper Cream, for a clever combination, or Vermouth Soup with Seared Scallops, Rocket Oil and Caviar for a sophisticated showpiece. Tips and techniques for adapting ingredients, texture or spiciness appear throughout. This excellent compendium shows how to combine the best in texture and freshness in a single bowl of soup.